When it comes to structural steel fabrication and erection, contractors are held to a high standard. The need for precision comes from safety standards that aims to ensure uniformity and reliability from structures of all shapes and sizes. From the beams that support your building to the bolts holding everything together, structural steel design has evolved to become more complex than ever. Every piece of your steel building will need to fit with zero variations. Steel plates are one component that can provide versatility and strength through numerous stages of construction. These plates can be manufactured to meet varying design specifications, giving builders more power in creating long-lasting results that are meant to last for decades or more. 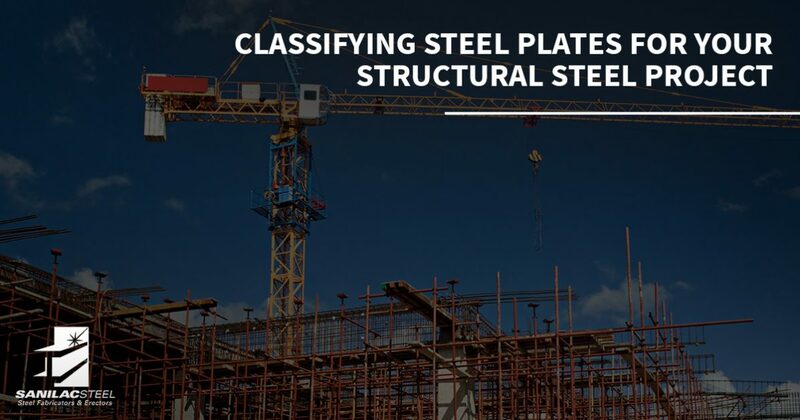 Today, we’ll highlight a few different types of steel plates to give you an idea of the variety of components available for your building construction. In order to find consistency in such a fast-paced industry, our structural steel fabricators here in Michigan and beyond have worked to enhance our proven skills and services since 1967. Sanilac Steel is proud to be among the top steel fabrication companies in the country, and our dedication to safe, cost-effective solutions to get the job done on time and on budget. In order to provide for a wide range of industries and applications, structural steel has evolved to demand many different products to create an optimal outcome. Agencies such as ASTM, ANSI, AISC, ASW, and more have developed uniform standards to ensure accuracy and compliance for a wide range of projects. From hollow tubes to massive I-beams, every component must adhere to these standards of quality. A36 – This plate, specified by the American Society for Testing and Materials (ASTM), is one of the most commonly used components today. A36 steel plates are hot-rolled and excellently suited for welding. When you combine this with its cost-effective creation and its high strength (think 36,000 pounds of force per square inch), it’s easy to see why steel fabrication company deals with this plate in high demand. A572-50 – This family of steel plates is known for its higher strength and yield, providing a wide range of advantages in larger applications such as bridges, buildings, and more. Whereas the A36 plate can hold support up to 36 ksi (kilopounds per square inch), These plates are designed for strengths over 50 ksi, providing much more strength with less weight. Contractors can benefit from the ductility and easy formation of this metal. 1020 – Steel plates in this classification from AISI feature high strengths, weldability, machinability, and ductility. This product is convenient, but remember that its low carbon content will resist flame hardening and induction hardening. Ultimately, 1020 steel is suited for a wide range of general parts that are not structural in nature. 1045 – AISI 1045 steel plates are medium in hardness and can be treated for additional upgrades to suit your building demands. With decent strength and resistance, 1045 metals are often utilized in machinery. Remember that efforts will need to be taken to prevent stress cracks from elements such as flame cutting. 4140 – This high-impact, low-alloy metal is specified by AISI to provide a high level of hardness and strength to your structure. With a targeted tensile strength of 95,000 pounds per square inch, 4140 steel is ideal for press plates, exhibiting extremely high levels of resistance and versatility. A514-T1 – Featuring a tensile strength of 100,000 psi, these steel plates are made to support heavier design loads. Structural steel fabricators often utilize this ASTM steel for heavy equipment as opposed to plates, providing better results with less weight. While you would normally find A514-T1 in cranes, trailers, and hauling equipment, this metal can also provide ideal support in specific building designs. A516 – Pressure vessels that require notch durability for the best results can benefit from grades 55, 60, 65, or 70 steel plates. This metal is ideal for the oil and gas industries, as well as a variety of other fields that require boilers and devices relying on pressure. A516 is simple to fabricate, strong, and highly weldable. Much more. Regardless of your design demands, our structural steel fabrication team can create the steel plates needed to get the job done right. Our team is highly skilled in personalizing our services for each customer, and our fabrication process ensures that you are receiving the best materials. Steel plates come in all shapes, sizes, and levels of hardness. If you are on this page seeking top-quality structural steel fabricators for your Michigan project, Sanilac Steel is here and ready to help. For more than 50 years, our team has worked diligently to create precise results backed by quality, affordability, and our team’s integrity. Contact us today to learn more or to see how we can help to get your project done!